So as most of you know by now, Dandelion Fire, released today. To promote the book, Random House sent Nate on a four city book tour for the next nine days. 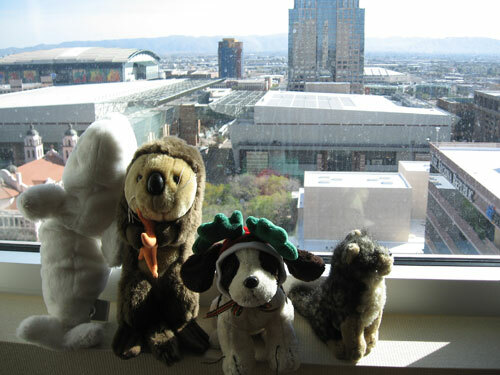 For some good family fun, Nate had each of the kids pick out one of their stuffed animals to keep him company. He then took the camera and you can see the results below. 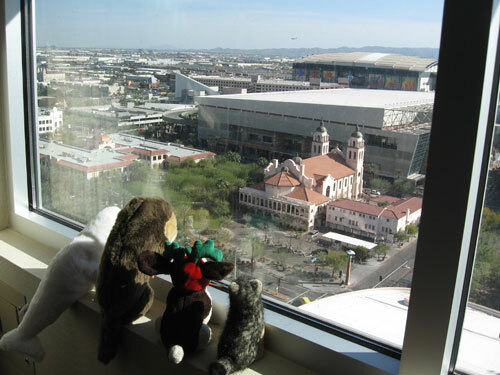 Left to right we see Ameera’s Natasha, the whale, Lucia’s sea otter, Seamus’ Bob, the reindeer dog, and Rory’s Wolfie, the baby wolf, enjoying a lovely view of Phoenix. The kids were very pleased when they saw the email this afternoon. Next stop, Chicago! That is so cute. What a fun dad your kids have! What fun! We look forward to their arrival here in Cincinnati! That’s just hilariously cute! Great idea. John went to the Borders in our smallish city of Grand Junction, CO last night to get his copy. Alas, they’d already sold out of the three copies that they’d started the day with. We went to see him and buy the book last night in Phoenix. He was a great encouragement to my daughter Morgan. Yesterday morning on the way to school she was asking me some questions about him. I told her that he is a strong Christian and really lives like one, that he is funny and he writes books. She turned around to me and said “oh mom, that’s exactly what I want to be.” She had some other thoughts which I won’t go into right now. Suffice it to say that although it is the primary duty of parents (Deut. 6) to raise their children in the paideia of God, it is a glory and an honor to our Lord when His people live as His people and encourage each other by their faithful obedience. When God’s people are faithful, no matter where they are in this world, all the people of God benefit from that faithfulness. May the Lord give you strength to continue to do the work He has set before you. Hey, he even stayed at a swanky place too! If I’m not mistaken, that’s a view looking southeast from the Sheraton Downtown hotel. (It’s one of our favorites.) Below is St. Mary’s Basilica, one of the oldest churches in Phoenix. I hope he also got to enjoy the very cool Roosevelt wine bar down the street . Glad Nate and his love creatures were willing to grace our sprawling city! Only FOUR cities and Columbus, Ohio was ONE of them? WOW! I couldn’t go…we’ve just adopted a child from Ethiopia and it would have been to intense for him to be present at a book signing…BUT my wonderful brother-in-love took MY copy of Leepike Ridge! Can’t wait to read Dandelion Fire!